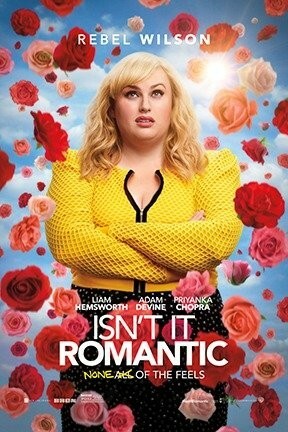 In Isn’t It Romantic, Natalie (Rebel Wilson) is unlucky in love... until she suffers a blow to the noggin that transforms her world! It's impossible for me to explain how much I absolutely loved this movie without reminding myself (and everyone else) how much I hated the last romcom about a woman who suffered a brain injury that altered her reality: Amy Schumer’s I Feel Pretty. But Isn’t It Romantic is everything that I Feel Pretty wasn’t: it’s smart, it’s hilarious, and most importantly, it doesn’t punch down. Plus, it has what I never realized every film needs, which is a bare-chested Liam Hemsworth playing the saxophone.